The second atomic bomb was over Urakami, the centre of Catholicism in Japan. August 9, 1945. 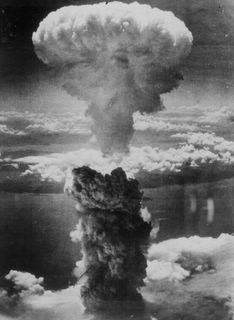 11:02 a.m. Bockscar, the B-29 bomber carrying a plutonium-core atomic bomb and commanded by 25-year- old Major Charles Sweeney, dropped its deadly cargo over Nagasaki from a height of 9,600 meters. Like the primary target Kokura, Nagasaki was overcast that morning. With barely enough fuel remaining to reach Okinawa, Major Sweeney and his crew had to pinpoint their target in the course of only one run over the city. By chance a crack opened in the clouds, revealing the industrial zone stretching from the Mitsubishi sports field in Hamaguchi-machi to the Mitsubishi Steel Works in Mori-machi and automatically designating this as the bombing target. The actual explosion, however, occurred some five or six hundred meters to the north over a tennis court in Matsuyama-machi. The details of the explosion can be summarized as follows. Known as Urakami, the district around the hypocenter (ground zero) area had been populated for centuries by Japanese people of the Roman Catholic faith. 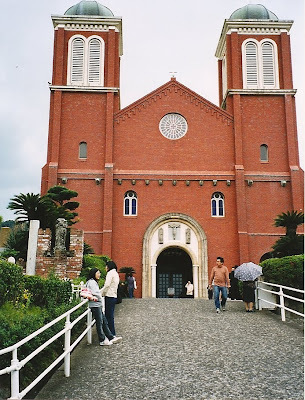 At the time of the bombing, between 15,000 and 16,000 Catholics - the majority of the approximately 20,000 people of that faith in Nagasaki and about half of the local population - lived in the Urakami district. It is said that about 10,000 Catholics were killed by the atomic bomb. Although traditionally a rustic isolated suburb, the Urakami district was chosen as the site for munitions factories in the 1920s, after which time the population soared and an industrial zone quickly took shape. The district was also home to the Nagasaki Medical College and a large number of other schools and public buildings. The industrial and school zones of the Urakami district lay to the east of the Urakami River, while the congested residential district of Shiroyama stretched to the hillsides on the west side of the river. It was over this section of Nagasaki that the second atomic bomb exploded at 11:02 a.m., August 9, 1945. 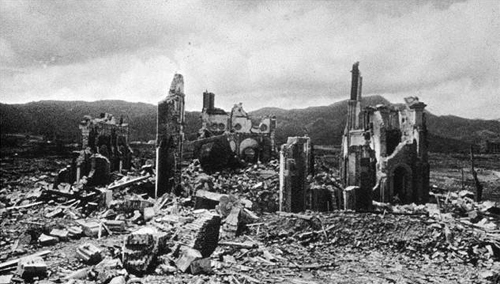 The damages inflicted on Nagasaki by the atomic bombing defy description. The 20 machi or neighborhoods within a one kilometer radius of the atomic bombing were completely destroyed by the heat flash and blast wind generated by the explosion and then reduced to ashes by the subsequent fires. About 80% of houses in the more than 20 neighborhoods between one and two kilometers from the hypocenter collapsed and burned, and when the smoke cleared the entire area was strewn with corpses. This area within two kilometers of the hypocenter is referred to as the "hypocenter zone." The destruction caused by the atomic bomb is analyzed as follows in Nagasaki Shisei Rokujugonenshi Kohen [History of Nagasaki City on the 65th Anniversary of Municipal Incorporation, Volume 2] published in 1959. The area within one kilometer of the hypocenter: Almost all humans and animals died instantly as a result of the explosive force and heat generated by the explosion. Wooden structures, houses and other buildings were pulverized. In the hypocenter area the debris was immediately reduced to ashes, while in other areas raging fires broke out almost simultaneously. Gravestones toppled and broke. Plants and trees of all sizes were snapped off at the stems and left to burn facing away from the hypocenter. The area within two kilometers: Some humans and animals died instantly and a majority suffered injuries of varying severity as a result of the explosive force and heat generated by the explosion. About 80% of wooden structures, houses and other buildings were destroyed, and the fires spreading from other areas burned most of the debris. Concrete and iron poles remained intact. Plants were partially burned and killed. The area between three and four kilometers: Some humans and animals suffered injuries of varying severity as a result of debris scattered by the blast, and others suffered burns as a result of radiant heat. Things black in color tended to catch fire. Most houses and other buildings were partially destroyed, and some buildings and wooden poles burned. 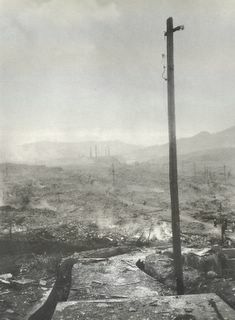 The remaining wooden telephone poles were scorched on the side facing the hypocenter. The area between four and eight kilometers: Some humans and animals suffered injuries of varying severity as a result of debris scattered by the blast, and houses were partially destroyed or damaged. The area within 15 kilometers: The impact of the blast was felt clearly, and windows, doors and paper screens were broken. Wall clock found in Sakamoto-machi about 1 km from the hypocenter. The hands stopped at the moment of the explosion: 11:02 a.m. The injuries inflicted by the atomic bomb resulted from the combined effect of blast wind, heat rays (radiant heat) and radiation and surfaced in an extremely complex pattern of symptoms. The death toll within a distance of one kilometer from the hypocenter was 96.7% among people who suffered burns, 96.9% among people who suffered other external injuries, and 94.1% among people who suffered no apparent injuries. These data show that the deaths occurring immediately after the atomic bombing were due not only to burns and external injuries but also to severe radiation-induced injuries. The late medical effects of atomic bomb exposure include "keloid" scars, atomic bomb cataracts, leukemia and other cancers and microcephaly (small head syndrome) due to intrauterine exposure. Although aware that the atomic bomb had the power to instantly kill or injure all people within a radius of four kilometers, the authorities were unable to determine the death toll and number of injuries in Nagasaki. Still today there is no accurate data on the number of people who died. A variety of factors contributed to this lack of information, such as the paralysis of administrative functions in the aftermath of the bombing and the inability of the postwar government to initiate a proper investigation. Another obstacle was the enduring nature of disorders related to atomic bomb exposure. A progressive increase can be expected, therefore, at whatever point in time calculations are made. There are countless cases of people who suffered injuries on August 9 and died after fleeing to areas outside Nagasaki city and prefecture, only to be registered as dying of causes other than the atomic bombing. Because of the lack of knowledge about radioactive contamination, meanwhile, many radiation deaths were attributed to diseases. The Nagasaki municipal government officially adopted the figure of "more than 70,000" deaths on the basis of information from population surveys and the estimate made by the Nagasaki City Atomic Bomb Records Preservation Committee in July 1950. Said the committee in its report: "73,884 people were killed and 74,909 injured, and 17,358 of the deaths were confirmed by post- mortem examination soon after the atomic bombing." 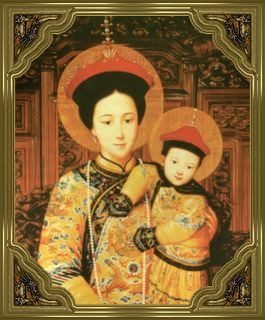 By 1945 the Nagasaki community of Roman Catholics, the descendants of these hidden Christians, formed the largest Catholic colony in Japan. Ironically, they inhabited the Urakami valley, which is the district of Nagasaki over which the atomic bomb exploded. The bomb killed nearly 9,600 of the 12,000 Catholics who lived near the hypocenter of the blast, leaving 70,000 people dead altogether. 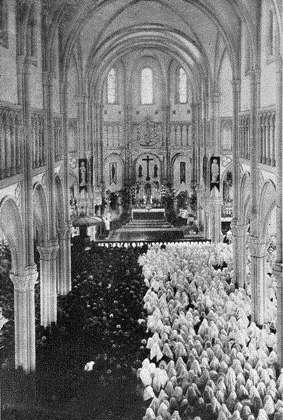 Their beloved church, the Urakami Cathedral, the largest Catholic church in the Orient, was utterly destroyed. Two priests hearing confessions at the time, along with dozens of penitents, were killed when the church collapsed on top of them. It is ironic that this most Catholic of Japanese centers should have been targeted for the second atomic bomb of 1945. One of the original martyrs executed at Nagasaki in 1597 was a Mexican-born Franciscan friar, canonized in 1862 as St. Philip of Jesus. As he was about to die on his cross, he is reported to have foretold that one day Nagasaki would be destroyed by "a ball of fire dropping from the sky." Nagasaki had been visited by St. Francis Xavier in 1549, and was the most Christian of Japanese cities with 10% of its population being Catholic. It contained the largest Catholic cathedral in East Asia; during the atomic attack, its roof crumbled killing dozens of parishioners that were about to give confession. Of Nagasaki's prebomb population of 22,000 Christians, most of whom were Catholic, only 13,000 survived the A-bomb. Another photograph from the 65th anniversary. I couldn't help but notice (who couldn't ???) how the women wear headcoverings. I first noted this last year and my interest was piqued. I thought they must be Traditional Catholics. However I found that that the Cathedral is not a traditional one. The mass is in Japanese, however the parishioner's hymn books are in Latin. I also read that Japanese Catholic women still wear headcoverings. Maybe the European traditionalists could take their lead from them. Churchgoers pray during a Catholic mass held Monday at Urakami Cathedral to commemorate the 65th anniversary of the world’s second atomic bombing in Nagasaki. The cathedral was destroyed by the bombing and rebuilt later. 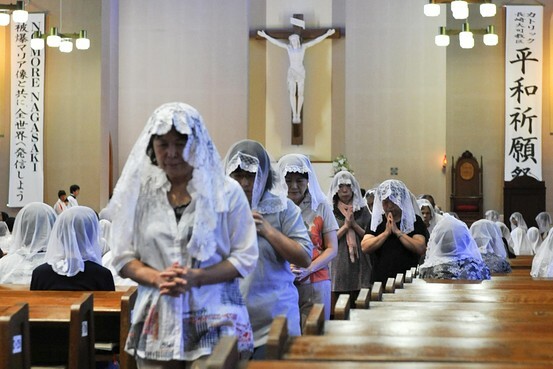 "Catholics pray for the victims of the 1945 atomic bombing of Nagasaki during a morning mass on the 66th anniversary of the bombing at Urakami Cathedral in Nagasaki on August 9, 2011." Rare photos from Time Life, not published at the time.